This report comes from Mr. Jun' lchi Takanashi, Chairman of the Modern Space Flight Association, and APRO's Representative for Japan. The witness has been given a pseudonym because he does not care to be identified at this time. The incident took place in July 1973 and at the time, the witness, whom we shall call Masaki Kudou, does not recall the exact date. Kudou, who was a sophomore at a University in the Kanto District, was employed during the summer as a night watchman at a lumber yard in a small industrial town on the south coast of Hokkaido. The incident, recalled to have taken place in July 1973, took place in the lumberyard, which is a deserted lonely place with only a few dark warehouses and chimneys in the distance. Kudu notes that the job isn't a particularly pleasant one as he was the only guard. After making his rounds of the lumberyard, he returned in his car to his parking place, switched on the car radio, lit a cigarette and was looking up at the clear night sky through the driver's window, when a streak of light ran across the sky. Inasmuch as the light went out immediately, he thought it might, have been a shooting-star, but then the light re-appeared at the very spot where it had gone out, in the same fashion as a bulb would be switched on, travel some distance, then be switched off and on again. It looked to be the "size of a baseball" and orange in color. Kudou admits that he was quite frightened, but he did watch the light which moved to and fro in all directions within the limits of one meter (no exact estimates are given - we don't know if this was at arm's length or what). Suddenly, Kudou said, the light began a spiraling descent and when it was down to an altitude just above the dome of a cement factory in the distance, it began to send out what appeared to be intermittent green light rays in one direction which he calculated to be north. At this point, Kudou noted, the whole episode seemed to be "science-fiction-like" and he was hoping that what he was watching would prove to be a dream or his imagination. After it had stopped its' "signaling", the object or light began to descend over the waters of the bay; describing a large arc which was executed with startling speed. Because the bay waters were within his range of vision, Kudou was able to observe what transpired from that time on. 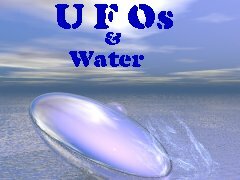 He said the light descended to an altitude of about 20 meters (75 feet) above the surface, of the water and stopped, and then from the underside of the light came what appeared to be a glass-like transparent tube and when the leading edge of the tube touched the surface of the water, that part of the tube began to glow and appeared to be sucking up the bay water. Kudou at this point was very puzzled and quite frightened, and dropped his head down, and when he lifted his head again the object appeared to have finished its sucking action and was maintaining its position in the same place. The next maneuver by the light was to head toward Kudou who became more frightened, and sat there glued to his seat watching it approach at about 50 meters altitude, becoming larger until it was "as large as a volleyball". The intensity of the light had diminished as compared to its light at a distance. (or, Kudou said, it might have seemed so as the surroundings were lit up by its light so that it was like daylight) and was white instead of the original orange. He could now make out more detail and noted that it was as smooth and round as a ping-pong ball, and he could now see what appeared to be small windows around the center of the object. In the central one and in another window two windows to the right, he saw two "eerie, shadow-like figures" which he said were “too small and deformed to be called the shadows of men". Kudou said that at this point he bowed his head until it rested on the steering wheel between his hands which had been clutching the wheel all the time. But he was fascinated also and continued to look at the object and had the feeling that he was bound hand and foot. As he watched he spotted what appeared to be three gasoline drums connected together lengthwise, hovering noiselessly in a blackish-dark-brown silhouette to the left of the lighted object. The lighted object with the windows began to move toward the elongated object, and then Kudou spotted three or four more round, white lighted objects, located to his left and to the right, of the long object. Then the four or five round white objects appeared to be "sucked" into the long object which then began to move into the north, at tremendous speed. Kudou recalls that Is the object moved away he began to realize his whole body was numb, “just as after we sit for a long time for a yogi practice," and his car radio was emitting "meaningless sounds." His head was aching severely also. Kudou thought that the experience lasted from 11 to 12 minutes although it felt as if it was much longer. He also said that he could not sleep that night after finishing his tour of duty on watch.